Quality Care Dental provides dental implants to replace missing teeth and restore function and beauty to the smile. 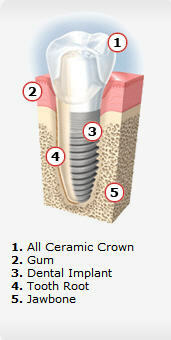 Dental implants are long lasting, resist wear and tear, and provide a strong foundation for dental restorations. With this advanced treatment, it is possible for patients who have lost one or many teeth to have a full smile. Dr. Mary Nguyen is experienced in placing dental implants and supplying custom dental restorations to patients in Winter Springs. Tooth extractions, trauma, or decay can leave an individual missing one or multiple teeth. Dental implants are designed to replace teeth which cannot be saved through other restoration methods. With an initial appointment, we will thoroughly examine a patient’s oral health to ensure dental implants are the right treatment for your smile. Dr. Nguyen will pay close attention to jaw bone density and oral health, two important factors in dental implant placement and restoration. In some cases, patients may need preparatory procedures to ensure the best chance at success. X-rays and impressions of the smile help plan out the procedure. After the first exam, our implant dentist creates a personalized treatment plan for optimal placement, which details how many implants are required and where they will be placed. After placement, patients will need healing time to permit implants to fuse to the bone. Then, custom-made final restorations are fixed to the implants with an abutment to complete the smile. Implant restorations are designed to appear similar in appearance to natural teeth; they retain comparable strength as well. Dental implants can be adapted to provide support for single and multiple tooth restorations. Implant-supported crowns, bridges, and dentures are customized to provide the best tooth shape and size for optimal form and function. Our practice is passionate about restoring the beauty and function of a smile to patients. Dr. Nguyen offers patients comprehensive dental implant care in Winter Springs. Call us to achieve a beautiful smile.